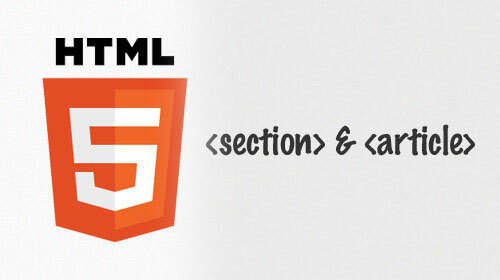 HTML5 articles and sections: what’s the difference? An article is an independent, stand-alone piece of discrete content. Think of a blogpost, or a news item. Section, on the other hand, isn’t “a self-contained composition in a document, page, application, or site and that is intended to be independently distributable or reusable”. It’s either a way of sectioning a page into different subject areas, or sectioning an article into … well, sections. Now we can see that the vital caveat refers to the whole article. If it had been inside the final section element, it would unambiguously refer to that section alone. It would not have been correct to divide up this article with nested article elements, as they would not be independent discrete entities, which is why we used the section element. OK. So we’ve seen that we can have article inside article and section inside article. But we can also have article inside section. What’s that all about then? Imagine that your content area is divided into two units, one for articles about llamas, the other for articles about root vegetables. (Or see today’s Guardian home page with its main news, a section of election picks, a section of “latest multimedia” etc). Why not article? Because, in this example, each section is a collection of independent entities, each of which could be syndicated—but you wouldn’t syndicate the collection as an individual entity. Note that a section doesn’t need to be lots of articles; it could be a collection of paragraphs explaining your creative commons licensing, an author bio or a copyright notice. In our example, each article could contain sub-articles or section, as explained above—or both. Jeremy Keith writes that authors are confused about when to use the two elements. I think the namearticle is a cause of confusion; perhaps post or entry or even story would be more intuitive if you’re thinking about blog or news sites (although not all sites are like that, of course). the only thing that distinguishes the definition of article from the definition of section is the presence of the phrase “self-contained”. A section groups together thematically-related content. An article groups together self-contained thematically-related content. That distinction is too fine to warrant a separate element, in my opinion. I agree that the difference between them is the “self-contained”ness. But, personally, I find it pretty easy to work out whether something is self-contained or not and have tried to explain it above. Your comments will hopefully let me know if I’ve explained it clearly enough. (I think it’s very tough explaining it in the terse language required in normative sections of a specification). It seems to me that brand-new elements will require people to spend time learning them without being able to immediately understand the difference in a matching exercise. Dan Cederholm’s Simplequiz showed that in 2003 many of us didn’t understand HTML4 elements properly. How many of us would have chosen ol rather than ul from name and single line from the spec if asked the most appropriate element for breadcrumb trails, or chosen dt as the most appropriate term for the speaker’s name in a dialogue (as the HTML4 spec wrongly specifies)? But seven years down the line, I imagine we all agree that it would have been wrong to amalgamate dl, ul and ol. This suggests that if you have a self-contained composition that you do not intend to be distributable via syndication, you shouldn’t use article. Section says “Authors are encouraged to use the article element instead of the section element when it would make sense to syndicate the contents of the element” – here, the intent of syndication is diluted into “it would make sense to syndicate the content”. I suggest that article be amended to say something similar, eg “The article element represents a self-contained composition in a document, page, application, or site which would make sense if independently distributed or reused, e.g. in syndication.” so that the two mentions of article match. If we didn’t have an article element, we’d be left with lots of different riffs on section,section or section, which is what HTML5 tries to avoid.